Today we gathered to celebrate the lives of the Old Friends residents who passed on during the last year: Benburb, Buzzovertomyhouse, Eternal Orage, Kano Doble, and Marquetry. It’s always sad to see the new markers, to feel that sense of finality that the beauty, presences, eyes, scents, individual merits and quirks that are still so vivid are now only memories. In some senses they are so near. Every one of them. 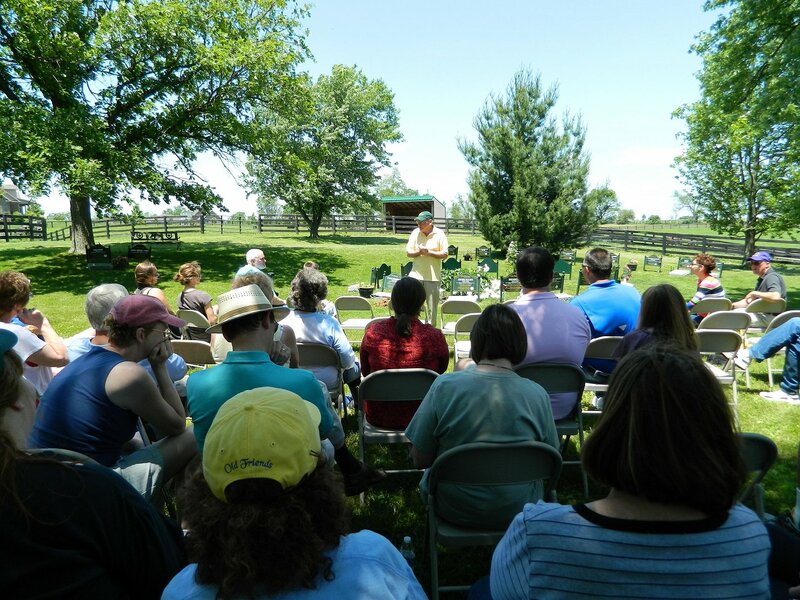 Our commemoration began in a way that is becoming a tradition, with longtime supporter Kyle Weisker’s melodic rendition of the National Anthem, followed by a tradition Old Friends has been fortunate to have included in every memorial gathering, Bill Mooney’s eulogy. 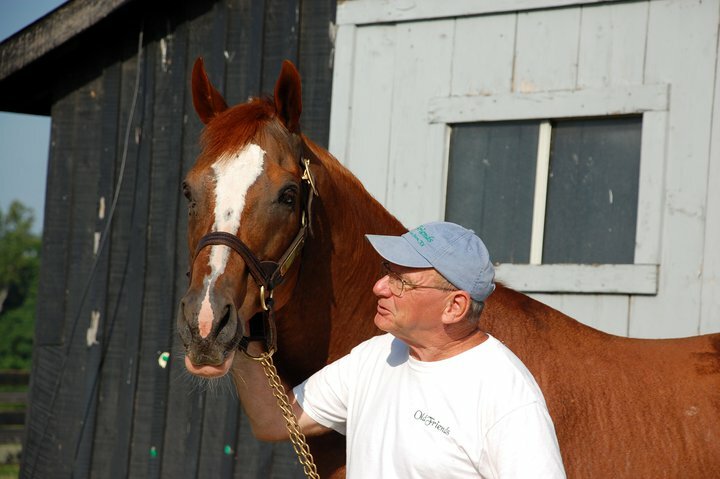 Bill won an Eclipse Award for his 2006 story about the last days of Old Friends resident Precisionist. 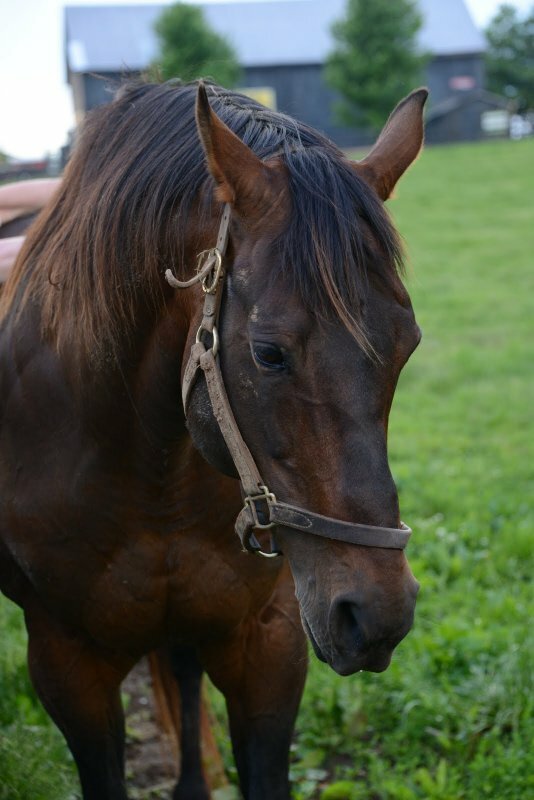 Buzzovertomyhouse, though not a remarkable racehorse, had a “tremendous family heritage.” The game, New England-based Eternal Orage had a remarkable win percentage, including multiple stakes victories. Kano Doble, by Holy Bull, also carried a proud heritage, being a great-grandson of the small but superlative mare Ta Wee. Volunteers and supporters shared memories. Tour Guide Mercer VandenBurg on Buzzovertomyhouse—“Aunt Buzzy,” as she was known to her friends at the Merefield facility—“Her strength was in her personality.” And Benburb mischievously showing who was boss with the occasional well-timed shove with his head. 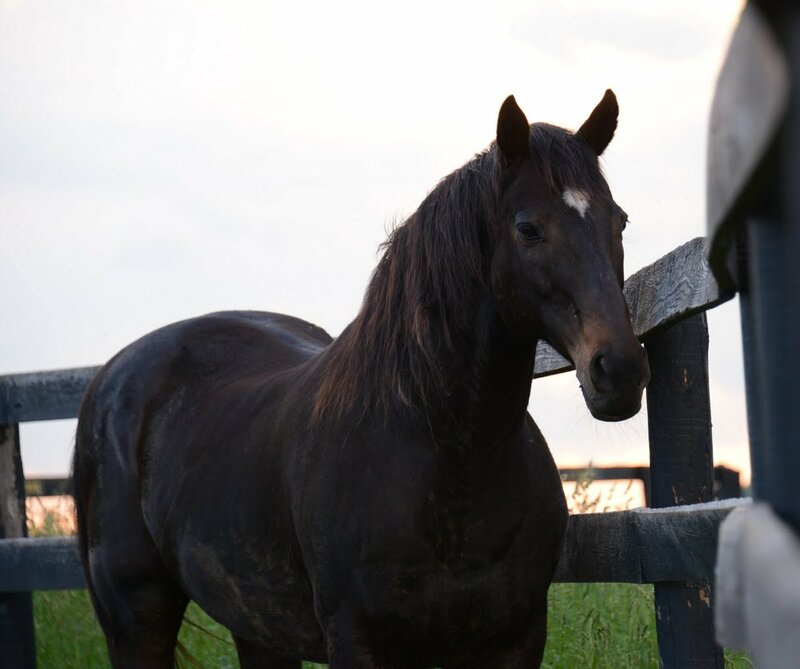 Louise, an equine photographer, remembered capturing Precisionist and Glitterman, as well as living residents Prized and Sarava, through her lens. Michael remembers Marquetry and Kano Doble. Photo by Carol Ayers. Bucky plays the final Call to the Post. Photo by Carol Ayers. 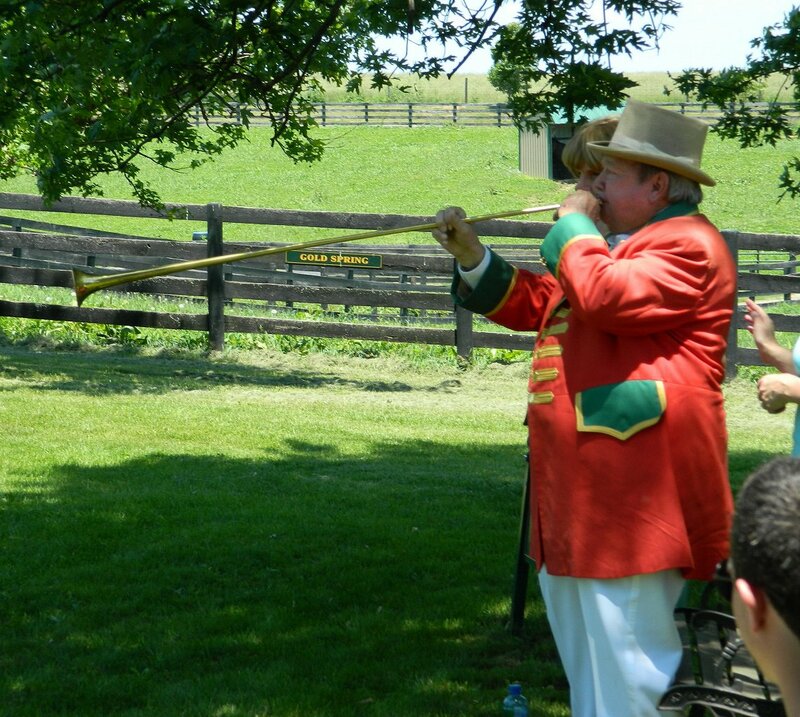 The memories having been shared, Keeneland bugler Bucky Sallee played the final call to the post for Benburb, Buzzovertomyhouse, Eternal Orage, Kano Doble, and Marquetry. The farewell did not go unnoticed by the living horses. Creator poked his majestic red head over the fence. Flick pricked his ears and gave a hop. Danthebluegrassman danced in place. Popcorn Deelites and Special Ring appeared over the rise of their paddock looking around as if to find out where the track was. We toasted the horses that we’ll always remember. We felt gratitude to have been part of their lives and to have helped make their final years happy ones. Under the May sunshine, we strolled this way and that among the paddocks, appreciating and celebrating our wonderful living Old Friends anew. Marquetry and Michael. By Rick Capone. 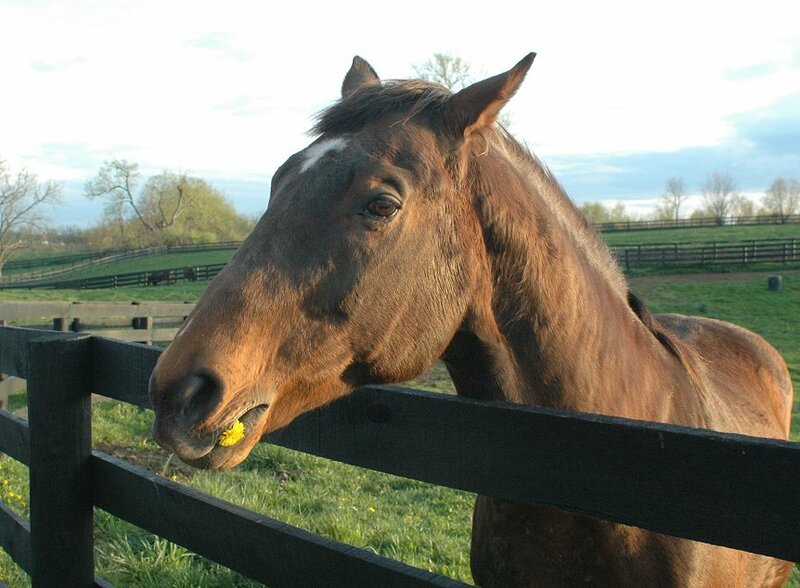 Eternal Orage enjoying a dandelion. By Laura Battles. What an amazing day Saturday was! Many people had the perfect idea about how to begin the long weekend: by visiting the farm. 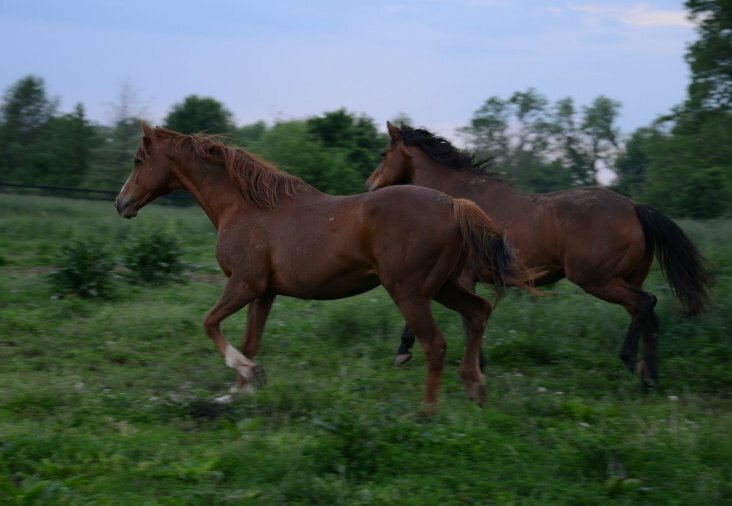 The clear, mild weather put the horses in a mellow mood and everyone, human and equine, enjoyed each other. And it wasn’t just that Saturday’s visitors were numerous. It was the magnificent heart they showed. If you’ve been to either of our locations, you’re probably familiar with our donations containers. Normally, all that’s generously left there goes toward caring for our horses, but the Kentucky farm contributed all donations from Saturday, May 25 to the Oklahoma State University Animal Relief Fund to help provide medical supplies and other care for the equine survivors of the tornado that devastated that area. The disaster especially hit home for us, since the Celestial Acres Training Center sustained so much loss of equine lives and property. 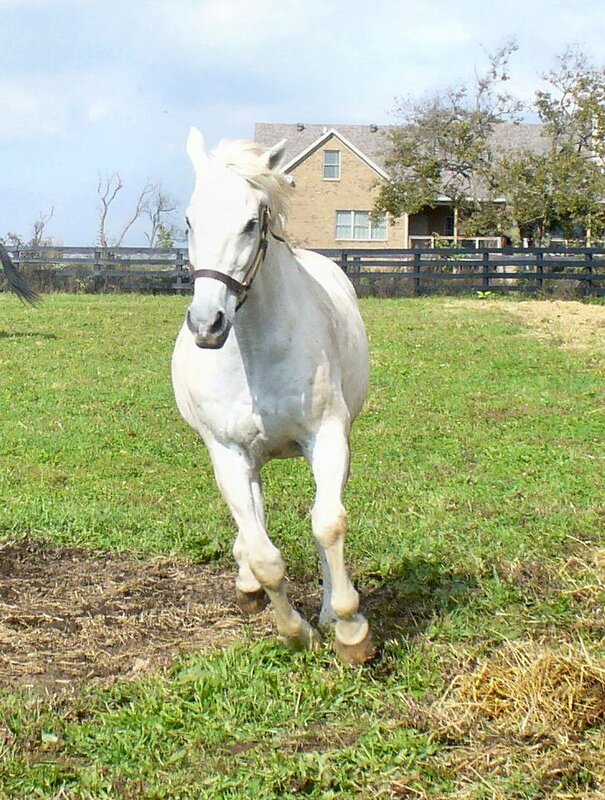 Celestial Acres stood Proper Reality (1985-2010) before he was retired from stud to our Kentucky farm. 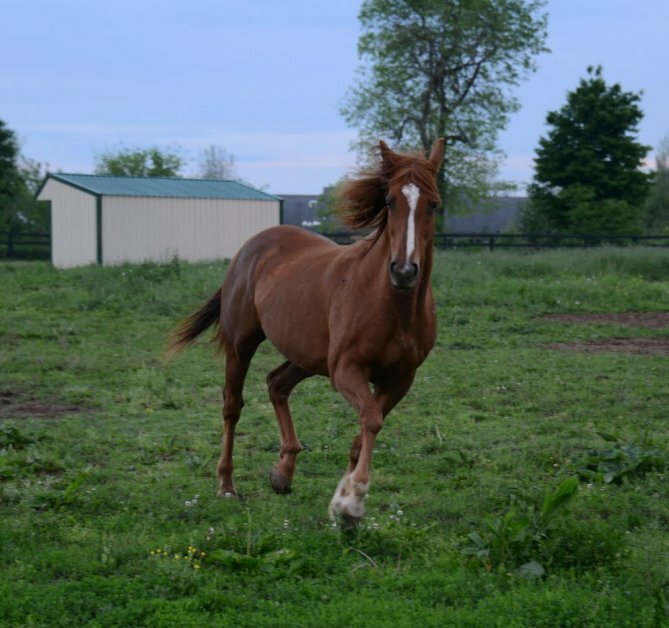 The donations for the equine survivors of the tornado exceeded our wildest hopes at $600.28. OF gratefully thanks all who gave, and the Hagyard Pharmacy (at the Hagyard Equine Medical Institute), which is coordinating local donations of funds, equine medical supplies, halters, lead ropes and other equine care products to the Oklahoma State University Animal Relief Fund through June 1. And, as if all this wasn’t enough to make Saturday eventful, in the midst of it, the new edition of the Daily Racing Form Old Friends Magazine arrived! If you enjoyed the first issue, wait till you see this one! With the 2013 Belmont Stakes approaching, the cover guy is 2002 Belmont winner Sarava in a superb photo by Barbara Livingston (who intrepidly sat on the grass of his paddock one evening a few weeks ago as the handsome guy frolicked all around her). Feature articles cover—of course—Sarava, the Bobby Frankel Division of OF at Cabin Creek Farm in New York, Rapid Redux, and Arson Squad. Or is the real centerpiece Little Silver Charm’s reflections on “The Secret of My Success”? Other pieces introduce our unsung heroes, the veterinarians and other caregiver specialists without whom we could not exist, the Old Friends Gift Shop (if you haven’t seen it in the last year or so have a look at its appeal these days), and neither last nor least, those essential OF staffers, the cats who so tirelessly and skillfully manage the office, barn, house, and even garage at Dream Chase Farm. 30 horses are profiled with photos, lifetime past performance stats and insights from some of the people whose lives they have touched, and the ”Old Friends Hall of Fame” pays tribute to 19 horses who have passed but whom we will never forget. Contributors include Glenye Oakford, Nicole Russo, Joe Nevills, Bill Mooney, Jay Hovdey, Michael Blowen, and on every page, vivid and gorgeous, majestic or whimsical, are many, many outstanding color photos, most of them by Barbara Livingston. 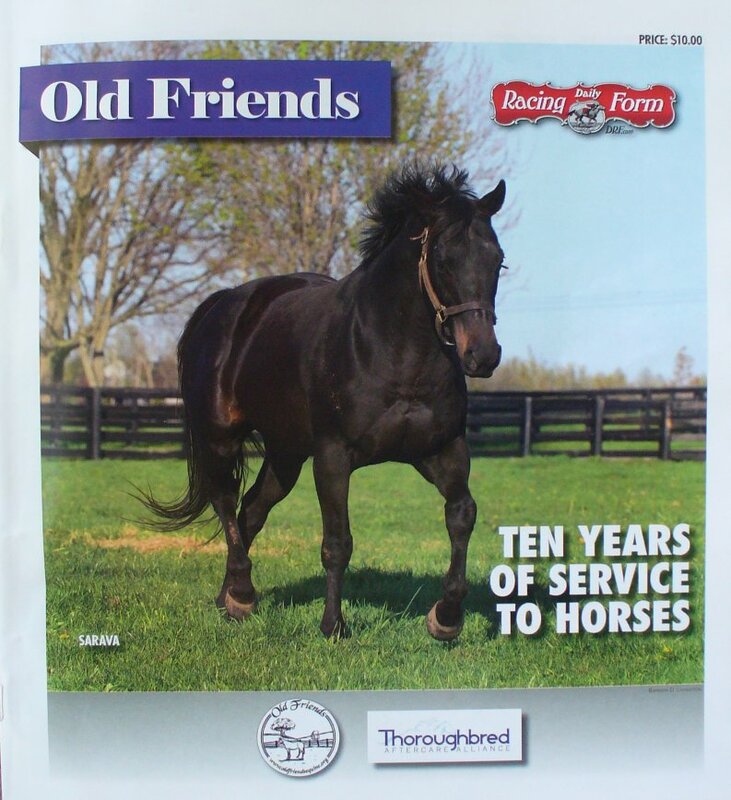 Old Friends thanks the Daily Racing Form for producing another even more memorable keepsake, and the individuals and organizations who sponsored the issue. Recognition is also due to volunteer Barbara Fossum who coordinated with the DRF through every step of both issues—outstanding job, Barbara! The new issue is available for $10 at Old Friends or $15 by mail. Old Friends has only a few absolutely, strictly observed holidays: Derby Day, Preakness Day, Belmont Day and Breeders’ Cup Saturday. The Saturday crew all being race fans, we close at some point on those afternoons and dash for the nearest TV. So last Saturday there was no 3:00 tour, but the 10:00 and 1:00 tours brought us some especially nice visitors. Particularly considering the idea about…ahem, decorating? that occurred to Special Ring (read on!). The gator that used to do the feed hauling and other farm work having bit the dust a few weeks ago, the big golf cart has been pulling double duty as farm vehicle and tour-mobile (as needed), so we were extra grateful to the folks on the 1:00 tour who thought to reserve it ahead of time. So the timing was perfect. We had the golf cart recharged in the nick of time and as Barbara played host in the office Michael was in the back yard hosing and scrubbing the mud from the farm chores off of it. Voila! A freshly washed, mostly dry chariot arrived to whisk the group off to their adventure on the farm! And to make a good thing even better, the insights provided by tour guide Laura and questionable driving provided by the chauffeur (me) were supplemented by the services of Old Friends’ very best tour guide…Buddy the office cat, who decided to accompany us. At least, part of the way. After all, he had to return to supervise the junior office cats, Lucy and Desi. Most of the tour was more fun than eventful. Gulch posed, Danthebluegrassman wanted Flick’s carrots, Ogygian wanted the whole bucket to choose from, and Bull Inthe Heather wanted a back scratch. Popcorn Deelites and Special Ring did their favorite routine, Ring avidly stealing the thunder from Seabiscuit movie star Pops by showing his identification tattoo for people to photograph (and for more carrots, of course). Their part of the tour over, we headed down the hill to the corners of the four paddocks occupied by Pops and Ring, Patton, You and I, and Prized. 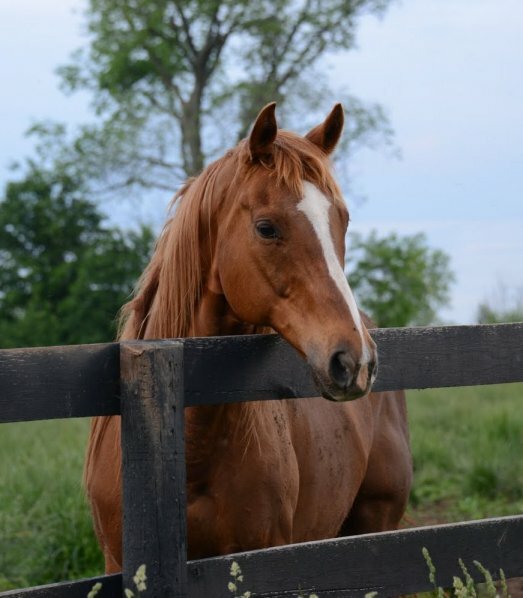 Patton was being his usual sweet natured self, gently accepting treats and—rare for a stallion, but typical of him—allowing his admirers to pat his nose and stroke him. Or, starting to. Down the hill thundered Special Ring. Wait a minute! He wasn’t ready to give up all that attention. Not just yet! 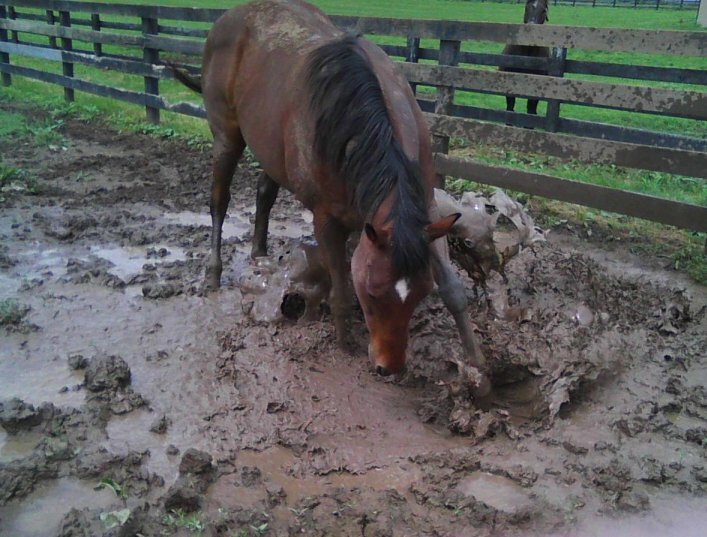 Reaching the puddle that had collected from the recent rain, Ringy gave it his all (see the photo)! 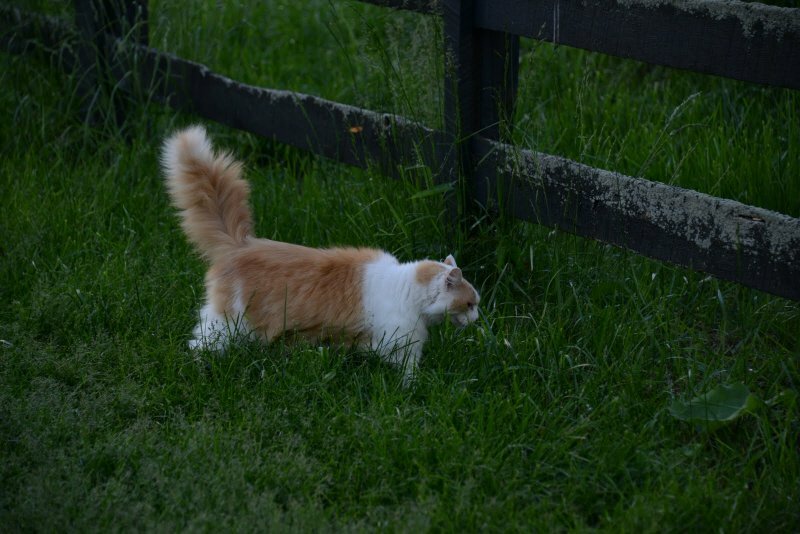 The runs where the humans are, even at the paddock corners, aren’t all that wide, and Ringy was very determined. He didn’t just paw the water a little, he kept it up vigorously for about two minutes, managing to splash most of us and—just as he hoped—to completely steal all the attention back from polite Patton (who you can see looking puzzled in the background). If you’re wondering why no people are in the photo, they’d all jumped back. Luckily, Ringy’s captive audience (canvases for his abstract painting? human Moneighs?) were gracious about his antics. It’s all in a day’s work for multiple G1 winner and inventively intelligent Special Ring. Apologies for the low quality of the above photo, which I grabbed my phone and snapped. Below are some better ones Laura took this Saturday. 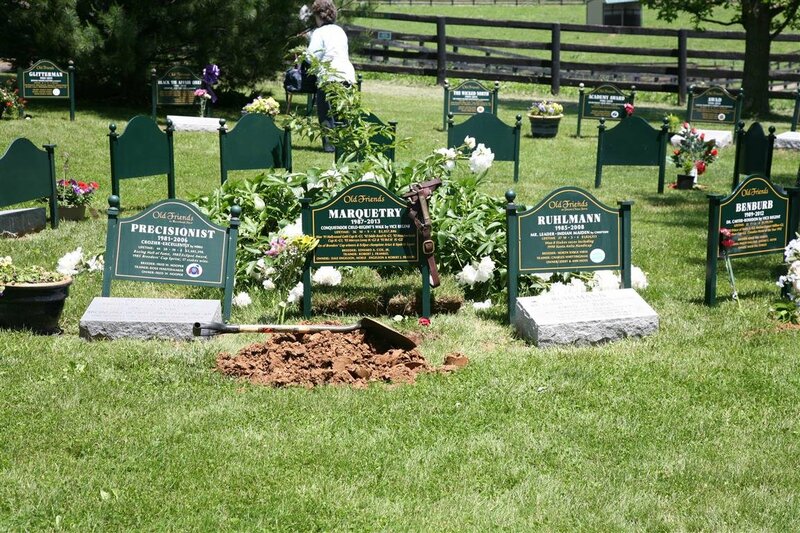 And just a reminder that you’re invited to the Memorial gathering this Monday, May 27, at 1:00 pm, when we will honor the Old Friends who passed during the last year, the superb Marquetry, Canadian Horse of the Year Benburb, the dependable and loving Eternal Orage, Kano Doble alias Mick, and from Merefield, Buzzovertomyhouse. 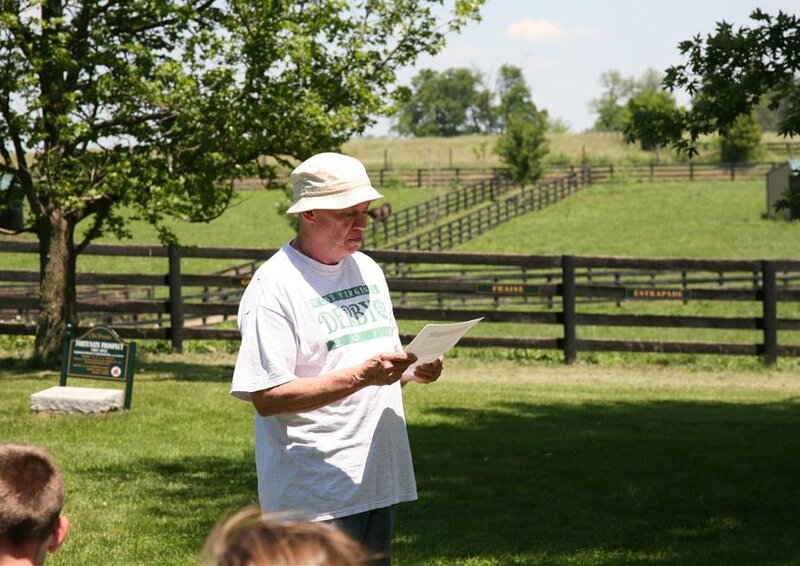 We miss them and hope you’ll join us on the farm, 1841 Paynes Depot Road, Georgetown, Kentucky, to remember them. We were stunned at our recent homecoming event with the large number of folks who came out to support us. It poured rain all day. Even with the wind and rain, we had a couple hundred guests pass through. It made me consider that it really does ‘take a village’ to do what we do at Old Friends. Our volunteers are truly amazing individuals without whom we could not exist. I want to thank each and every person who helped and I’m just praying I don’t forget to mention someone. Please forgive me if I do. The morning began with Moneigh Mary, Cindy, Garnetta and Peg setting up the auction in our barn. They stayed all day long running it until we packed up at 6ish. Over at the tent, Patty Stinnett was working on securing the tent roof and had gallons of rainwater dumped on her. She also made a donut run at our local bakery for us and she cannot even eat donuts. Now that is above and beyond the call of duty! Alex LeBlanc took our morning tour group out and came back soaked. As a matter of fact, Michael and Diane, Beth Shannon, and Rick Horton were rain-soaked for most of the day. Sarah from Georgetown College helped out all morning. Viv Rowe, Laura Battles, Viv Morrison, and Rick Capone were all on hand to pitch in. Mercer VandenBurg worked the beverage station after fixing breakfast at his church all morning. Mary and Jason Matthews provided a wonderful cake! Roberta and Bea were working hard in the office and gift shop. Our trusty tour guides Charlie Brown, Tom Beatty, Rick Horton and Beth Shannon were on hand to guide folks around in the rain. Barbara Fossum and Barbara Bowen did a great job working with our auctioneers. The list of our Donors of auction items is astonishing and too lengthy for me to do justice. From our local signature horse farms who donate halters, to our supporters far and near who sent auction items this past year for this event – we thank all of you most gratefully. Our very good friends, Shades of Grass came to play music and had to squeeze into a small, semi-dry corner of the tent. They did a fantastic job. Everyone enjoyed their music so much! Tom Sayre and Curt Sharff have kindly been our auctioneers for years now. They are the best! Furlong’s BBQ dinner was delicious as always. We thank our sponsors, Ale 8 One and Southern States for their continued support these past years at this event. Special mentions should go to Michael Blowen, our founder, as I watch him running completely non-stop for at least a 60 day stretch this time of year. Michael sets a high bar for the rest of us. Diane White is the constant, consistent, quiet tower of strength behind all of us. Nothing is too small for her attention and we would be lost without her. Janet and Kent work very hard around the clock caring for the horses. Our regular core volunteers who couldn’t volunteer at this event; Linda, Teri, Rachel, Martin, Kelly, Tim, Nick, Rick, Ellen, Carol and Elizabeth are diligent and dedicated individuals. Bea Snyder volunteers in the office and gift shop six days a week. All year long. She attended Ferdinand’s Ball on Thursday, ran our booth at Beulah Park on Saturday, worked Homecoming all day Sunday and…. was back in the office on Monday. Her dedication is an inspiration to me. This event is the end of our busiest week (Derby week) in our busiest month of the year. We are all already exhausted by the time Homecoming arrives. Our volunteers persevere and get us through each day all year long. Truly, they are the backbone of our organization. On a daily basis, all these folks give of themselves, hold us up and allow us to operate. They are the greatest group of people you can imagine. We can never thank them enough. P.S. from Michael: Sylvia often goes unnoticed in the back organizing all of our Old Friends activities from soup to nuts.. and I do mean nuts. She doesn’t allow the smallest detail to escape her attention. She’s one of the only people at Old Friends who can keep the small picture and the Cinerama view in perspective, simultaneously. All of the retirees owe her an awful lot.